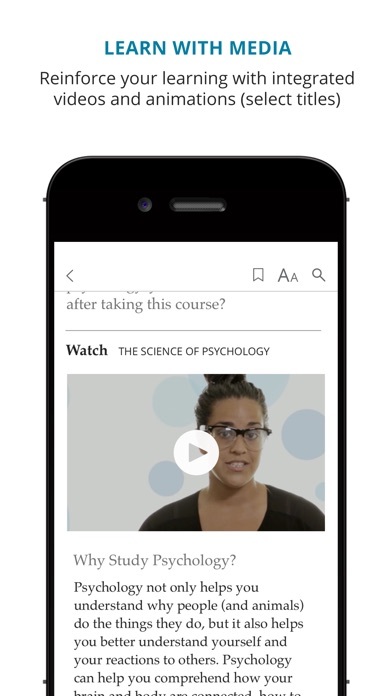 Study anytime and anywhere with the Pearson eText app—even when you don’t have an Internet connection. Wherever you are in your day, it’s easy to add your own notes, highlights, and bookmarks, and learn using interactive media. 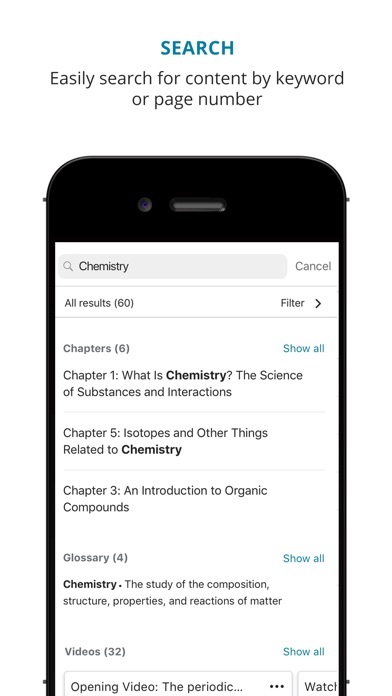 The app lets you access college-level Pearson eTexts in one place, including those from MyLab and Mastering courses, and Digital Collections. Log in with the same username and password you use for the web-based versions of those Pearson products to get started. It’s easy to navigate, very helpful in class. The app even allows you to continue when there’s no good connection available. Sometimes the E-text is convenient but it frequently has issues and keeps crashing when I need to be using it for class. Will try to delete and reinstall, but I don’t recommend wasting your time on this. What a piece of crap. MML makes me want to yeet myself off of a cliff every time I use it. So many things about this program does not work properly. I called customer service and was told that I couldn’t access my school work because mobile devices are not supported. If I had another option I would use it. I will be writing to my school to tell them that they should look into using another service. When I use my laptop some of the functions don’t work with that as well. Out standing for on the go studying. Forgot your book at home? No problem Pearson etext has your back!!! It’s great that you can read while on the go. Not having to carry a book is great. Although the only thing I didn’t like; I don’t whether it’s this particular book or the app but Apple iBooks provides you with a definition of any particular word. Which I find helpful when I don’t know the meaning of a word. The textbook works well and I’m happy with it. I can access all of my math work and the account gives me no trouble. They need to add a read aloud reader to the app or format the app in such a way that the document reader on the iPhone can read the text aloud. iPhone can read tons of on screen text, why not this ebook? sometimes when i am reading my textbook, i like to copy and paste into an app that reads it aloud for me. if you won’t let me have this, at least add a feature to your app that will do this for me. i still miss the only person i have ever loved and a love lost is about as great a torment as grief. 2 stars because of navigation problems. Started out as 3 stars but I kept running into more issues. 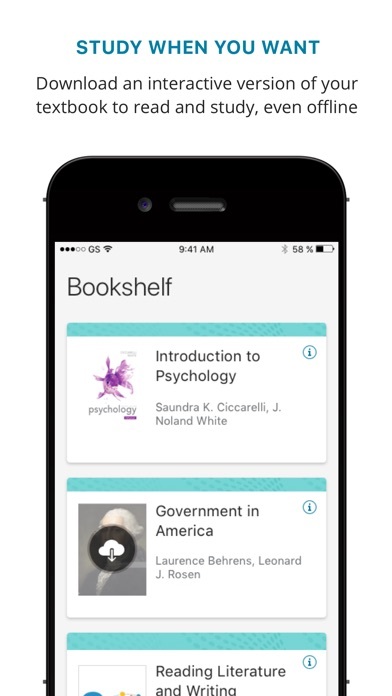 For as much money as students are forced to throw at Pearson, you might think the app would at least have the basics figured out. I can’t specify what part of a chapter I want to jump to from the table of contents. For example, I want chapter 1 > section 1.2 > practice problems. Instead my only option is chapter 1 > chapter 1. Pointless. It’s annoying to have to keep swiping and swiping and waiting for the pages to load, especially if I need to keep referring to the text during my homework. Can’t enter the page number I want to jump to. Search feature doesn’t tell you what page or section the results are from. Tried using bookmarks to make up for poor nav. Bookmarked each section of chapter 1. In “my bookmarks” they’re all titled the same thing “Chapter 1: Graphs and Functions” then the page number. Not helpful. At least let me name the bookmark whatever I want if you aren’t going to put the effort in to tell us what it is. Zooming in sometimes crops the bottom of the page off and won’t let me bring it into view. I don’t like precalculus. I like it even less when I have to use this app. The app was working fine but now as I study for my exam the text will not show up. Pearson needs to get it together. This app keeps freezing when you open it. You have to reset the app a couple times before it actually works. Bookmarks and highlights does not sync when accessing in other device or from Pearson Lab. It’s fine when it’s working apart from the not syncing part of bookmarks & highlights and incessant freezing. The only thing that would make this better is if they had the option to read it to you. Great to read on the go, however, I think developers should also create an app to allow homework to be done. Sometimes I'm on the go the whole day and I find myself read the chapter, but I also have homework to do. The thing is i can’t do any homework because this app doesn’t have the option to do homework, it would be really useful to have the homework option. Everything looks the same, sections aren’t separated by pages, page numbers are hard to find. These issues would extremely mitigated if you actually let me go to a specific page. It’s such a simple feature, yet it’s absent. Teachers assign readings by page numbers, how am I supposed to efficiently do them if I can’t get to the pages? This is gr8 I use this all the time but it won’t rotate to whole screen on my phone. can someone help? The pearson etext for nursing randomly freezes. Also, the “continue reading” option doesn’t work, it takes you to a random page. And now bookmarks don’t work. Great. Lower your prices for garbage products, please. The convenience of having the textbook within reach and easy to carry can not be ignored. 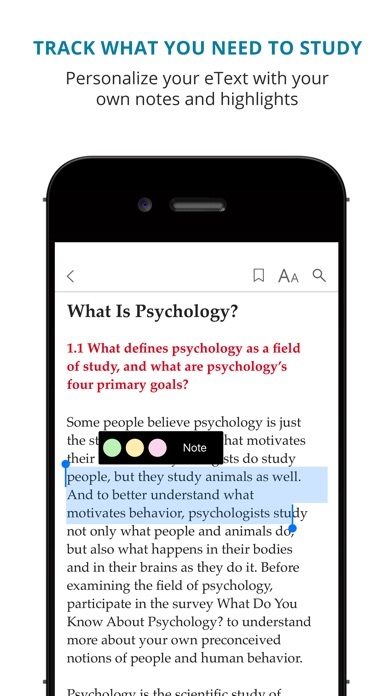 Though I wish there were different colors which use to highlight and ways to easily access notes from the textbook page rather than flipping between two different areas. There is also the issue of the textbook never saving my page, so I have to either bookmark it or search for each time. The greatest annoyance however is that the very edge of the page is eaten by the page turning interface. With my inability to adjust the page size so I can the last few words on the page, I’m forced to pull the page up and hold it, making note taking and highlighting hard. I suspect there is little that can be done, as there is little incentive for them to actual change the situation or issues. Yet I felt it important to share these glaring flaws in a rather convenient application. Because this is horrendous enough of a product to make me do it. Pain to navigate (both in the app and the web version, so beware all around) and the pages won’t scroll up entirely. There have been folks complaining about that for awhile and apparently Pearson doesn’t care. I really really regret buying the etext on the assumption this would be user friendly. It’s an OK app and does what it says, but IT NEEDS AUDIO!!!!! Really do not want to go to the myBradey website every time I want a text book read to me. Please add!!!! It’s very convenient for me to be able to read my textbooks on my phone. I love it! Since I downloaded the app it started fetching my bookshelf and still I don’t see my book for my school. This is one useless book reading app I have ever seen. Do not recommend. I am stuck with it because of my college. First off I should let it be known that I hate Pearson and think they exploit college students with overpriced books and required codes. But you’d think that some of that money would go towards a decent app; nope. The app is horrible, buggy, and one of my books apparently decided to be filled with mostly blank pages. It works fine on their slightly less terrible website but I would like to read it from what I want to read it from, not whatever my last option is. So I have an online class that requires us to have the online book. I was excited that I could read the book on the go and high light stuff. So when I get home I can write all my notes.. well I just got on the app to do some more reading and ALL MY NOTES ARE GONE! I was getting ahead in class so I don’t fall behind with my busy schedule.. and now all my hard work is gone. And I’m starting over again. You should really get this fixed since every other review I have read says the same thing. Oh and it keeps telling me my subscription has expired.. I just bought my book. -Doesn’t have the chapters subdivided like on desktop so that they can be quick navigated to -Can’t view in landscape mode -Zoom function doesn’t allow the bottom fifth or so of the page to be viewed -Manual bookmarks must be made in order to save your spot in the book (the “pickup where you left off feature has been available on just about every e-reading app for awhile now); unable to navigate to a specific page number But why make the app more than barely functional when you have a monopoly on the textbook and e-educational market. I’m normally a person who prefers a hard copy; at first I was excited, highlighting in different colors for different categories and adding my notes, the study tool feature is amazing but what is NOT amazing is the fact that my notes from last night are completely gone this morning. I planned to review my notes from last night and move on but now I have to backtrack. This needs to be fixed!! I can zoom in to read, but if I do that, I have to hold the text the whole time to read what’s on the bottom paragraphs. If I let it go, the page bounces back up. I can read the rest of it fine, but this needs to be adjusted so I don’t have to read the book in tiny writing. You also can’t rotate the screen either, it can only be read in portrait mode. What’s even the point of having the ebook? I had the old version and updated it to this. The old version allowed you to scroll through pages easily and preview them, as well as jump to a certain page number. The new version makes it very difficult and comes up with every time the number 50 shows up in the book should you search for page 50. I give myself a headache trying to read the size of this text. Please add a zoom feature!!! Whenever I highlight, its all gone by the next day when i want to review the key points, or gone within the hour. It’s frustrating, if i had the choice, I’d buy the hard copy textbook but my school doesn’t offer that. Aside from fixing the highlighting issue, i wish they’d add underlining or a way that i can write notes on the sides of the paragraphs with my Apple Pencil. I was always on the go so this help me so much we being able to read.I could pull it up anywhere without needing the internet and using data.As a college student I need pretty inexpensive books so the digital book is the best on my wallet. Haven't experienced any issues. However, it would be better the bars at the top and bottom to disappear when reading. It slightly covers text and I have to scroll up every page. It would be best if that could disappear and reappear with a tap. A page finding function would be useful as well. The text is very interesting and engaging. In the app, one problem: I can bookmark it but I cannot get to my bookmark page when I reopen the book later.